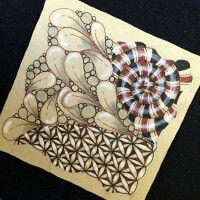 Zentangling or tangling is actually a formalized process that defines itself as something other than mere doodling because of its theory and approach. While the process may look intricate, it is a deceptively simple pathway to relaxation and inner focus. In fact, proponents of the practice note that it has multiple benefits including calming an anxious mind, increasing self-confidence, and cultivating moment-to-moment awareness in a similar way as mindfulness meditation. There’s much more goodness to be read here, so be sure to click over to read the whole article (it’s not that long–calm down). Think you can’t do it? You can. I promise. It’s actually quite easy. Get in touch and I’ll be happy to show you how!